Lester Flatt, Earl Scruggs, and the Foggy Mountain Boys were an influential bluegrass band performing and recording from 1948 through 1969. After leaving Bill Monroe's Blue Grass Boys to form their own band, Scruggs' pioneering three-finger banjo picking style and Flatt's crooning bluegrass vocals gave the group a distinctive sound that won them many fans. They soon became a popular touring, recording, and broadcast act, although they were not invited to join radio station WSM's famous Grand Ole Opry until 1955. In the 1960s, Scruggs' banjo playing won additional fans in the growing folk music market and the band brought the bluegrass sound to a wide national audience with "The Ballad of Jed Clampett," the theme song to the hit television comedy The Beverly Hillbillies. After experimenting with a more commercial sound, the group broke up in 1969. 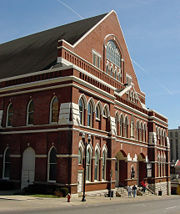 Flatt founded the more traditionally oriented Nashville Grass while Scruggs led the more experimental Earl Scruggs Revue. Flatt died in 1979, while Scruggs still performs occasionally. 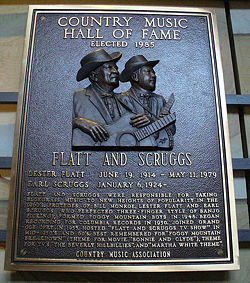 Flatt and Scruggs were elected to the Country Music Hall of Fame in 1985. Bill Monroe's 1945-1948 bluegrass band—featuring Monroe on mandolin and tenor vocals, Earl Scruggs on banjo, Lester Flatt on guitar and vocals, and Chubby Wise on fiddle—created the definitive sound and instrumental configuration of bluegrass music. Scruggs's revolutionary, three-finger picking style was a huge attraction, while Flatt's smooth vocals blended perfectly with Monroe's intense tenor. In November 1950, Flatt and Scruggs made their first Columbia recordings. Benny Sims was replaced by Chubby Wise as fiddler, while Everett Lilly played mandolin, replacing Curly Seckler. In June 1951, the group recorded “Jimmy Brown, the Newsboy” for Columbia, featuring Scruggs on guitar instead of banjo. During this period they made several changes of radio stations. In 1954 Seckler re-joined on mandolin and Benny Martin won acclaim as the Foggy Mountain Boys' fiddler, adding his virtuoso solos to complement Scruggs' still unequaled banjo playing. Martin's fiddle may be heard on many Columbia cuts from this time, notably “Dear Old Dixie,” “Why Did You Wander,” “If I Should Wander Back Tonight,” and “Flint Hill Special.” The latter also featured Scruggs’ recently invented D-tuners enabling him to bend individual strings to create a popular instrumental effect. In June 1953, the Martha White flour company had begun to sponsor Flatt and Scruggs on daily morning radio broadcast for the powerful radio station WSM in Nashville. Later, the Pet Milk Company became a co-sponsor, and the group was featured on some 40 television stations, while also appearing at live concerts in Nashville, Chattanooga and Jackson, Tennessee. Flatt and Scruggs were now the biggest name in bluegrass. In September 1954, the group appeared with Old Dominion Barn Dance on the Broadway show “Hayride,” at the 48th Street Theater in New York for two weeks. Paul Warren replaced Benny Martin as fiddler. Gradually, Flatt and Scruggs brought about changes in the group that gave them a sound more distinct from Monroe's classic band. They temporarily eliminated the mandolin in the mid 1950s, substituting the entertaining "Uncle" Josh Graves on dobro, and adding a second guitarist to sing tenor harmonies. They also began to emphasize Flatt's baritone capabilities, instead of pitching him as a lead tenor, as had been the case when he sang with Bill Monroe. Up to this point, WSM would not allow Flatt and Scruggs to join its flagship Grand Ole Opry radio show, possibly out of loyalty to Monroe, who was believed to resent Flatt and Scruggs' success. Pressure from Martha White executives and the public demand finally caused WSM to relent in January 1955. In October 1957, Columbia released the group's first LP, Foggy Mountain Jamboree. Scruggs’ appearance at the first Newport Folk Festival July 1959 as a guest artist with the Hylo Brown bluegrass band produced a major impact on the emerging folk music scene as the New York Times praised him as the “Paganini of the five-string banjo." The next year, Flatt and Scruggs and Foggy Mountain Boys played the festival themselves and also appeared on a live CBS network television show, “The Revlon Revue: Folk Sound, USA.” In April 1960, the group recorded with drums for the first time, a move that Flatt resisted. Flatt and Scruggs began playing the university folk music circuit in 1961. On December 8, 1962, the group appeared at Carnegie Hall, and Columbia soon released a live album of their performance there. On the strength of the success of The Beverly Hillbillies television show, Flatt and Scruggs' version of “The Ballad of Jed Clampett” reached number one on the country charts, the only bluegrass recording ever to do so, although purists complained that it was really a Hollywood-written television theme song. (The television vocal track was not performed by Flatt, but by studio musician Jerry Scoggins, with the band's backing.) The song was nominated for a Grammy Award. Flatt and Scruggs also made several personal appearances on the TV show itself, playing old friends of the Clampett family. After Flatt and Scruggs performed their original song “Pearl, Pearl, Pearl,” on the show, this record reached number eight on the country charts in 1963. The band also recorded the theme for the “Petticoat Junction” television series. Influenced by Columbia executives, the group's style began to lean toward the slick “Nashville sound” as exemplified in the Nashville Airplane and Changin’ Times albums. The group added Charlie McCoy on harmonica in 1963, as well as other studio musicians, also using drums more frequently. Soon, actor Warren Beatty asked Scruggs to create the theme for his new movie, “Bonnie and Clyde.” Scruggs obliged with “Foggy Mountain Breakdown,” which was not a new song, but a perennial concert favorite recorded first for Mercury. The tune won the Foggy Mountain Boys a Grammy. After the success of “Bonnie and Clyde,” Columbia pressured the group to further alter its sound with additional Nashville studio musicians and song material by the likes of Bob Dylan. The band's commercial success, however, placed a strain on the relationship between the traditionally minded Flatt and the more experimentally oriented Scruggs. They played their last stage concert together in February 1969 and recorded their final sessions for Columbia in August of that year. Lester Flatt formed the Nashville Grass, playing a traditional form of bluegrass, while Scruggs created the more experimental Earl Scruggs Revue with his son Randy and other young musicians. Flatt passed away in 1979, while Scruggs, at this writing, still occasionally performs, despite a noticeable diminishing of his formidable instrumental skills. Flatt and Scruggs' greatest legacy is the influence of Scruggs' banjo playing on future bluegrass banjo players, from more traditional players such as J.D. Crowe to innovators like Bill Keith and experimental musicians such as Bela Fleck. Thousands of young bluegrass banjoists today graduate from beginners to yeomen by mastering Scruggs' solos note for note on songs like "Foggy Mountain Breakdown" and "Flint Hill Special." Beyond that, Flatt and Scruggs left a large corpus of excellent recordings, featuring not only Scruggs' banjo playing but Flatt's pleasant vocals, amazing fiddle solos by Benny Martin and others, and great dobro playing by Josh Graves. Despite criticism for their later commercialism, some consider Lester Flatt and Earl Scruggs and the Foggy Mountain Boys to have been the greatest band in bluegrass history. Flatt and Scruggs are ranked number 24 on CMT's 40 Greatest Men In Country Music, created in 2003, one of only four non-solo artists to make the list. Bill Monroe, however, ranks number 16. Video of Flatt and Scruggs playing "Randy Lynn Rag"
History of "Foggy Mountain Boys"
This page was last modified on 17 April 2017, at 23:22.